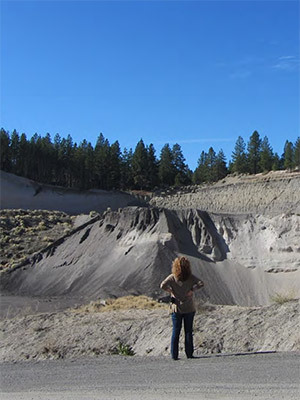 A remediation plan for the Deschutes County demolition landfill proposes reusing excavated and cleaned material from the landfill to then grade and fill the pumice mine to the desired level, as well as portions of the landfill. Engineering consultants hired by Oregon State University – Cascades to study the viability of developing the Deschutes County demolition landfill have designed a reclamation strategy that could eliminate 29,600 truck trips and minimize the impact of campus development on the community. The strategy envisions a scenario where the 72-acre county landfill, in addition to the 46-acre university-owned pumice mine, could become part of a campus serving 3,000 to 5,000 students. The plan proposes reusing excavated and cleaned material from the landfill to then grade and fill the pumice mine to the desired level, as well as grade portions of the landfill. The approach may eliminate the need to import any backfill material for the pumice mine from off-site, which is estimated to take as many as 29,600 truck trips. Besides preparing the pumice mine for campus development, the reclamation strategy would transform the unused landfill into 36 acres of fully developable land, and allow for an additional 36 acres that could be developed for passive uses, such as sports fields, open space, parking lots or solar panel fields. “This study shows that the possible addition of the landfill property will create a rare opportunity to reclaim land considered unusable, develop it sustainably and with minimum impact on neighbors, and to build a community asset that will contribute to the region for years to come,” said Kelly Sparks, associate vice president for finance and strategic planning at OSU-Cascades. The study determined that the majority of the material from the site remediation could be safely reused on-site. Engineers identified three distinct areas or “cells” of the landfill, categorized by age, use and fill materials. The remediation plan would involve excavating two of the cells, and processing and sorting the excavated material, with any unwanted material taken off-site. The fill in those two cells includes clean cover soil, wood waste from the mills, construction debris, metal and tires. Usable material would then be used to fill the third cell, as well as bring the pumice mine to a level suitable for development as a campus. The engineering study is part of the due diligence process undertaken by OSU-Cascades as the result of a Letter of Intent signed with Deschutes County in 2015 that provided a framework for exploring the viability of reclaiming the former demolition landfill, as well as its possible acquisition. OSU-Cascades collaborated with OSU’s College of Engineering, state and federal agencies, and nationally recognized reclamation experts, to evaluate the landfill’s use by Oregon State. Maul Foster & Alongi, a nationally recognized environmental engineering firm based in Portland, led the study. The company received the United States Environmental Protection Agency’s 2013 National Brownfield Redevelopment Phoenix Award for EPA Region 10, for its work guiding the City of Astoria’s municipal landfill closure and sports complex redevelopment project. Maul Foster & Alongi has worked on brownfield remediation projects throughout the Pacific Northwest, including in Oregon.